JM Space Frame Roof & PEB Structures Pvt Ltd.
Metal roofing sheets are strong are particularly strong and durable requiring very low maintenance.These are very cost effective too in the long run. It is a Technology initially adapted by American Army, have a widespread demand in India for Warehouses, Manufacturing Units etc., its been Producted & Installed at site without any Trusses Purlins or any other Secondary Members. We deal in Pre Painted Metal Roofing Sheets. We are a most trusted name among the topmost companies in this business, involved in offering Ridge Plate. Product prices Our product range starts from 25000 rs. and it will be vary as per product specification. 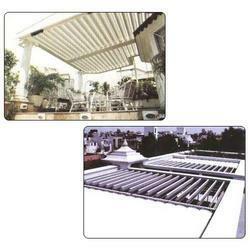 We are the leading service-provider of Metal Roofing System. These can be used as single skin roof or can be used in combination with insulation to give thermal and acoustic characteristics. Crimp Curved sheets are developed to provide versatility and creativity to bring new and refreshing design to commercial, industrial and domestic buildings. Direct from factory to your doorstep.